Before you install Rancher, you’ll need a server to install it on. You can install Rancher on a bare-metal server, a VPS, or cloud server– the only requirement is that the machine can run Docker. 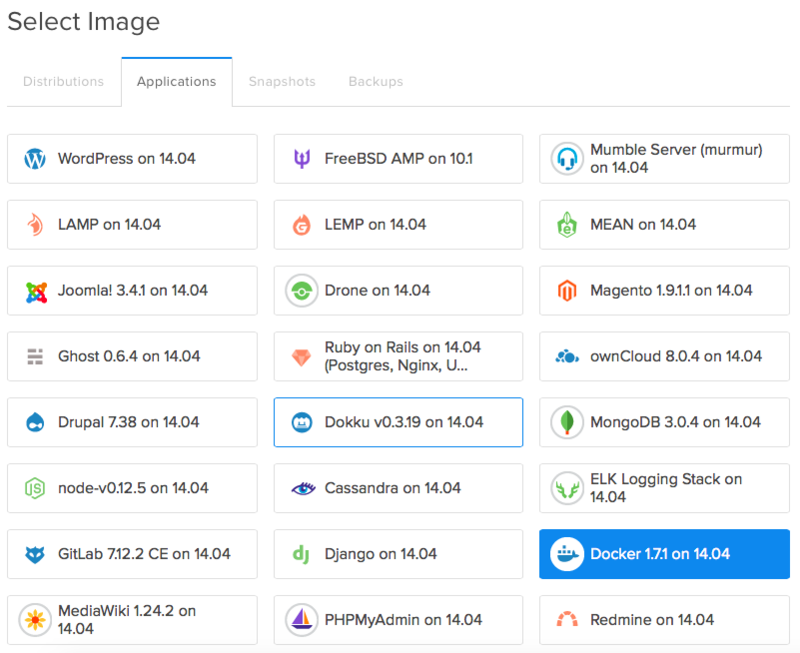 You can easily get started on cloud providers such as Digital Ocean, that offer a pre-Dockerized Ubuntu system with a single click. If you don’t have an account with Digital Ocean, you can get started for free with a $10 credit. That’s enough to run two 512 MB servers for a month. Once you’ve created an account, simply click the green “Create Droplet” button in the top right hand corner of the dashboard– a “Droplet” is Digital Ocean’s terminology for a virtual server. Go ahead and enter a host name, choose a Droplet size (1 GB is the recommended minimum, especially if you’re going to use this node to both run the management console and your own services), and region. For the image, you can select “Docker 1.x.x on Ubuntu 14.04”. As of publication, the current version of Docker is “1.7.1”. The User Data script allows for you to configure your instance at first boot. There are a couple different types of scripts you can run, including Bash scripts as indicated by the #!/bin/bash. All we need is for the Rancher server container to be launched, binding to port 8080 so that it is accessible to the outside web. You can also install Rancher on AWS EC2 relatively easily. You can simply create a new instance with the Ubuntu 14.04 AMI. Because the Ubuntu AMI doesn’t include Docker by default, we have to install it with a User Data script. You can find the User Data input inside of the “Advanced Details” section of the “Configure Instance” step. As you can see, the User Details script is somewhat similar to the one that was required for Digital Ocean. The only difference here is that we install Docker before we install Rancher. Ensure you also select a key pair you have access to, since you will need to SSH into the machine.